If you haven’t jumped on the avocado toast bandwagon yet, then you’re missing out! Some foods are so simple, so easy that, they just don’t get the attention they deserve. Avocado toast deserves a billboard in Times Square. It’s really just smashed avocado with a few simple ingredients on top of a piece of toast. Simple, right? But when you take one bite into it you realize it is so much more than that. Plus, I’ve jazzed mine up with a few extras to make it even more special. It’s silky, rich and delicious – perfect for breakfast, lunch, dinner or a quick snack. Here’s how I made mine. Slice an avocado in half and remove the pit. Scoop the avocado into a bowl and add the juice from half a lemon. Using a fork, smash the avocado until just slightly chunky. Season with salt and pepper and a pinch of red pepper flakes. 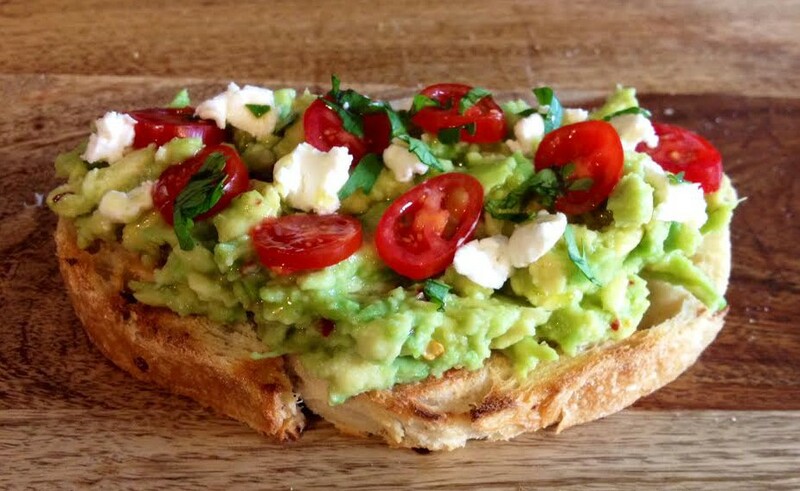 Spread the avocado mixture on top of a piece of toasted, rustic bread and garnish with thinly sliced cherry tomatoes, goat cheese crumbles, a sprinkle of cilantro and a drizzle of really good extra virgin olive oil. Oh, and did I mention, you can top it with an egg for an even more sinful snack?! I love smashed avocado on sandwiches and burgers. If you smash it, it doesn’t fall apart as easy. Your toast looks yummy and healthy.